IIT-JEE (Joint Entrance Examination) is an All India Level Engineering Entrance Exam conducted in two screening levels i.e., Mains followed by Advanced for admission to undergraduate courses like B.Tech, B.E., B.Planning, and B.Arch in 23 renowned Indian Institutes of Technology (IIT). 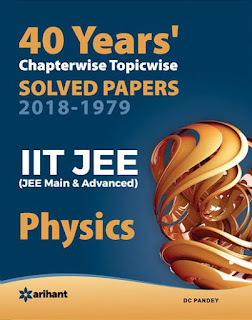 The given book titled “40 Years’ Chapterwise Topic-wise Solved Papers” of Physics has been revised for bringing the abundant knowledge of the subject based on the nature of both the exams to the students. The best part about this Two-in-One book is that it comes with ample amount of solved papers of Mains as well as Advanced from last 40 Years’ Questions (1979 to 2018) and not only covers the entire concepts Chapterwise but Topicwise too. In this book, students will find 17 chapters along with JEE Main & Advanced Solved Papers of 2018 which is going to help them in a large manner for the forthcoming exam. As efficient as possible and as supplemented as required, this book is one of the very few genuine sources to help leading dual success in IIT-JEE 2019.